The same year the Duluth Ship Canal was first permanently bridged, finally connecting Park Point to the rest of the community, Lake Superior saw one of its worst storms on record. 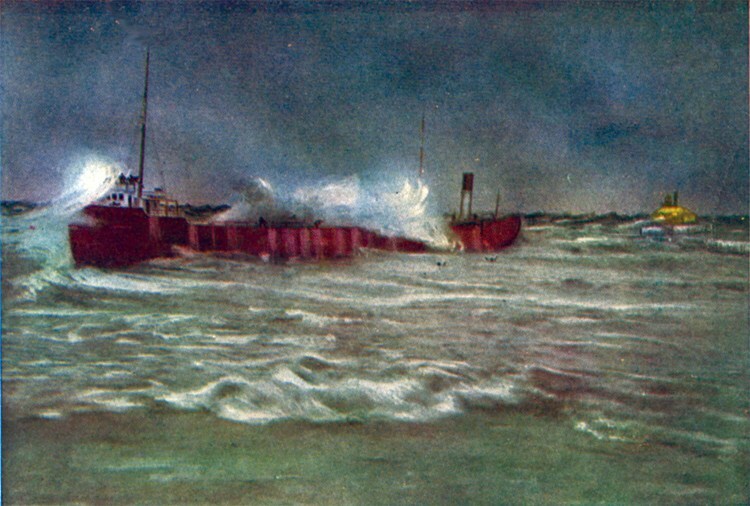 Vessels navigating Lake Superior on Tuesday, November 28, 1905—two days before Thanksgiving—found themselves battling hurricane-force winds. The water on Lake Superior’s western end was so high it drove through Minnesota Point at a spot known as “the barrens” hard enough to cut a channel. That day and the next, twenty-nine ships were wrecked or suffered damage, seventeen were stranded, and at least one foundered. Ships lost or damaged in the storm near Duluth include the Umbria, the Elwood, the George Spencer, the Amboy, the Ira H. Owen, and the John Smythe, which the Mataafa had been towing when the storm hit. The Crescent City ran aground two miles east of Lester Park; its crew used a ladder as a gangway to escape the ship. Further up the North Shore, the Madeira was under tow of the William Edenborn; the Edenborn’s captain cut the tow line thinking it would be safer for the Madeira. It wasn’t. The ship struck Gold Rock, north of where Split Rock Lighthouse now stands. Crewman Fred Benson grabbed a coil of rope and climbed a sixty-foot cliff while the storm raged about him. He then dropped the rope to the Madeira and saved eight other crew members. Only the first mate perished, pulled down with the ship as he tried to climb the mizzenmast and jump to safety. The human toll was also heavy; the storm took thirty-three souls, nine of them just outside Duluth’s ship canal. A crowd of thousands gathered near the ship canal to watch ships attempt to ride out the storm. The Mataafa, hauling a load of iron and towing an equally laden barge, the James Naysmyth, appeared out of the squall in midafternoon, steaming hard for the canal and the safety beyond it. Her captain ordered the Naysmyth cut free and anchored to ride out the storm. As the Mataafa entered the canal, currents and wind gusts forced the ship into the north pier; conditions then carried it back into the lake before slamming it broadside against the pierhead. About 150 yards from shore, the Mataafa settled to the lake bottom and split in two. Desperate sailors in both the fore and aft cabins—which were still above water—signaled for help. Members of the U.S. Life Savers stood helplessly on shore, the storm too strong to launch their lifeboats. That night thousands of Duluthians lined the shore, standing vigil as the storm pounded the wounded ship. In the wee hours of the morning, the flickering light in the pilothouse went dead. When the Life Savers finally reached the ship the next morning they found fifteen sailors—including the ship’s captain—alive. Unfortunately, nine of the crew either drowned or froze to death. The aerial bridge’s ferry car had been lashed in place over the north pier during the storm. Both the bridge and car held firm, and engineer McGilvray said the structure had weathered the storm “without a tremble.” Only a portion of one of the approaches was damaged. The storm did eventually have a positive effect: the Mataafa sinking, and the Madeira, the Lafayette and Manila going down near Gold Rock and the Split Rock River, convinced the government to build two lighthouses, one at Split Rock, the other at the eastern end of the Duluth Ship Canal’s North Pier.